Gov. 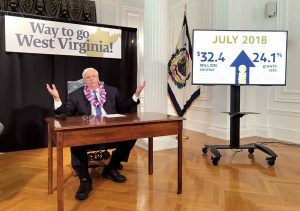 Jim Justice celebrates record revenue numbers for fiscal year 2018 and for the month of July. CHARLESTON, W.Va. — State officials were in a celebratory mood Tuesday morning after unveiling the final end-of-year surplus numbers, including positive numbers for the first month of the new fiscal year. Sitting in front of a banner saying “Way to go West Virginia” and sporting Hawaiian leis, Gov. Jim Justice and officials with the Department of Revenue presented the latest revenue numbers in a press conference Tuesday in the Governor’s Reception Room in Charleston.